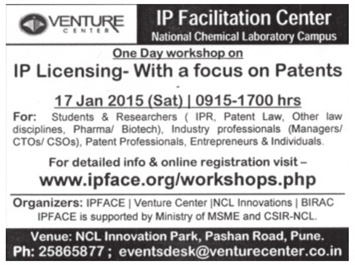 7 Jan 2017 10th Pune Inventors Network (PIN)- Half day workshop on "CHALLENGES FACED BY BIOTECH/BIOPHARMA/PHARMA PATENT APPLICATIONS AND STRATEGIES TO OVERCOME THE CHALLENGES"
Basic understanding of patents for students and researchers to enable them to make the best use of the patenting system. Learn how to seek protection for your (or your organization's) inventions, secure rights and license/ commercialize patents. What are the challenges in Open Innovation? "Patenting of products of natural origin in US and India with insights on Myriad case and Overview of The Biological Diversity Act, 2002 and role of National Biodiversity Authority with implications on patenting and commercialization." "Patent Cooperation Treaty (PCT): The System for Worldwide Filing of Patent Applications"
To understand provisions relating to International applications under Indian patent Act. Learn about "Micro- IP portfolio strategy for SME/Individual Inventors"
18th May 2013 1-Day Intensive Introductory Workshop on "Software Licensing and Pricing"
23rd Feb 2013 1- Day Introductory Workshop on "Setting up and running an in-house patent cell"
Moderated interactive session on "Concepts of IPR and related FAQs" with Dr. V Premnath (Scientist) and Dr. Nitin Shukla Tewari (Scientist) of NCL Innovations. Learn about European Patent Practice, including issues relating to the Patenting of Computer Software by IP expert John Brunner who is Partner in a leading Patent & Trade Mark Attorneys Firm in London. 15th Sept 2012 Second Meeting of Pune Inventors Network (PIN) on "Advise and insights for inventors on how to take their ideas ahead - including government support schemes"
Learn how the funding schemes can help the innovators, entrepreneurs and MSMEs in getting their idea to the market and benefiting from them. 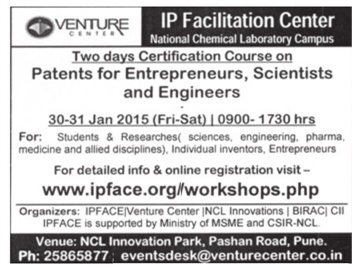 Introduction to Patents, Designs, Trademark, Copyright etc. To learn about avenues available for technology commercialization. The focus will be on TREMAP, a government funding scheme open to individual innovators. How to draft powerful patents. Strategic drafting of patent claims. Distinguishing with respect to the prior art. such as patent, copyrights, trademark, Industrial Designs etc.